HR 1 is deceptively titled "For the People Act"
HR 1 is bad policy, unnecessary and unconstitutional. 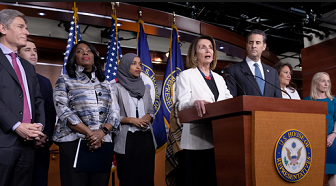 The Democrat majority led by Nancy Pelosi is pushing for misguided comprehensive election reform which will upend First Amendment rights. Her deceptively titled "For the People Act" (H.R. 1) is a laundry list of far-left policies that would compromise election integrity and strip power from the states. The problems with H.R.1 are many, and in his testimony before Congress, Heritage scholar and election expert Hans Von Spakovsky summarized them as such, "Sometimes legislation proposed by Congress is bad policy; sometimes it is unnecessary; and sometimes it is unconstitutional. H.R. 1 is all three." It forces states to restore the ability of felons to vote the moment they leave prison. It automatically add ineligible voters, such as illegal aliens, to voter registration lists. It transfers the right to draw congressional districts from state legislatures to "independent" commissions whose members are unaccountable to voters. It turns the Federal Election Commission into a partisan body by reducing the number of FEC members from six to five. To see the full list of problems with H.R. 1, check out this fact sheet. Nancy Pelosi intends to make this her signature piece of legislation in the 116th Congress. All conservatives should say no to this dangerous bill and vote against the liberal crusade to legalize voter fraud. If you are from Kentucky, click on the link below to send your message to your Congressman. If you are not from KY, call 1-202-224-3121 and leave a message for your Congressman to vote NO on HR 1.